On windy days, how many times do the bails get blown from the stumps? Rather than removing the bails altogether and the complications that brings, here is the solution. 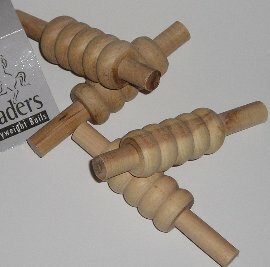 Made by Readers, here are two pairs of heavyweight bails in an adult size. They weigh approximately half as much again as standard bails. They are made from a heavy wood such as lignum vitae and conform to MCC dimensions.